Learn to play the piano the new, fun way. LineSpace turns sight-reading practice into an engaging and addicting game. Start out learning the easy way, with color coded keys–but learn fast, and switch off the colors to triple your scores! Increase the pace and difficulty at your discretion, and tweak your technique to score even higher! Great for kids, gets them competing against themselves and others. LineSpace provides an immersive learning environment with multiple forms of feedback. Besides visual notation display, different pitched tones are sounded before playing, when the correct notes are played, and when an incorrect note is played. Train your ears at the same time you train your fingers! LineSpace contains a unique generative music engine. In order to actually train you to read the notes on the staff (instead of just building muscle-memory), all of the music is randomly generated–the pattern is never the same twice! But instead of being completely random, the music generator follows standard rules of music theory–so what you are playing actually sounds like music. This is a fantastic Music Learning Application that makes a game out of learning the note names of the Treble Clef and Bass Clef lines and spaces. In addition, this application ensures that users are able to identify the correct note name with the corresponding piano key. Young and older students alike will find this music learning game both fun and practical. The game-play and reward system will both keep your students’ attention and keep them coming back to it for a very long time. Recommended for your iPad music tool arsenal? Yes, especially for very young students. (By the way, I only do reviews of applications that I feel are useful and interesting to educators). Caveats/Suggestions: Great game and I highly recommend it. The ability to store different user scores would be a great addition for classroom usage. Tweet This Application Review Directly (You can edit the text before you send)! 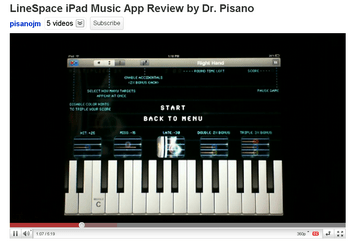 iPad Music App. Developers: Read our CALL for application submissions here!